Holiday decorating brings about mixed feelings for me. I love the change of pace, the nostalgia and tradition. But, some years, the time and energy feels overwhelming. This is one of those years – baby’s first Christmas comes after traveling for Thanksgiving and catching a few germs. I sat down with my friend, Amanda Purdom, of AsterHouse Design for a little inspiration. Amanda is an interior designer and I knew she would have just the tips I needed. We met at Amanda’s home, which is lovely. It is cozy and inviting, while beautiful and chic. Amanda shared her three best pieces of holiday decorating advice, and she also let me snap a few photographs. Now I cannot wait to get started on my own home! Design for all five senses. Sight. Sound. Touch. Taste. Smell. We all know the five senses by heart and yet, few experiences pique all five. 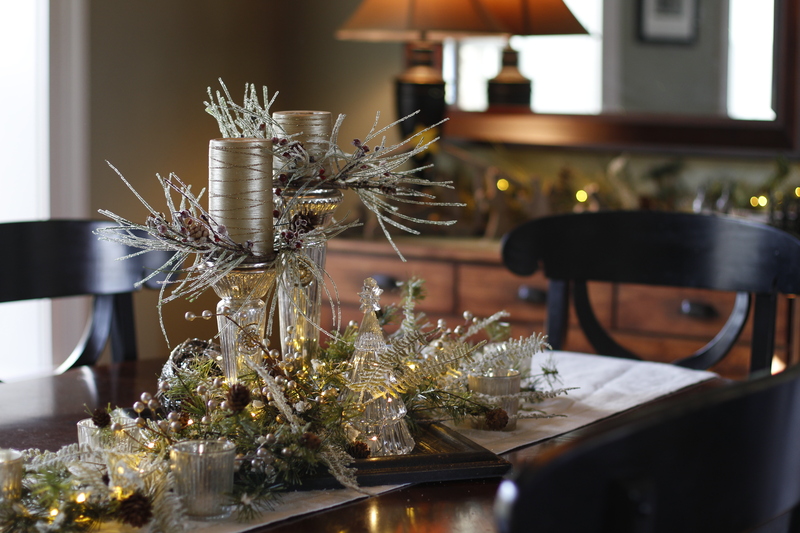 Amanda suggests holiday decorating that appeals to each of the senses, which helps create a memory. After all, memories are what become traditions! Amanda uses lots of different textures for touch, her favorite candle for smell, holiday music for sound, and homemade candy for taste. Her dining room table is a perfect example of designing for the senses! Mix various items so they do not all match, but rather look collected. Try balancing something old with something new, quirky with traditional, and sparkly with rustic. 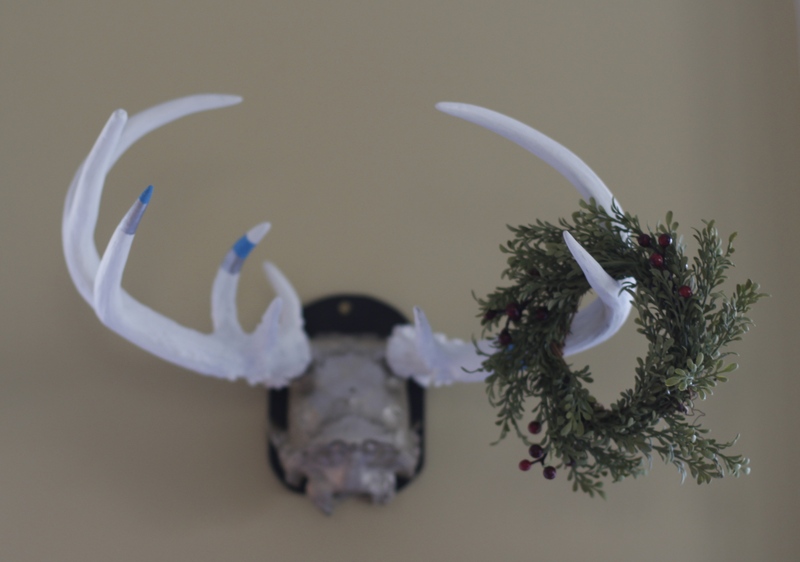 Who thinks to hang a wreath from a pair of antlers? This is hilarious. It is a perfect mix of traditional and quirky counter balance. The key to creating a complete look is fullness, Amanda says. When you place your greenery, use multiple colors and textures like evergreen, sparkles, ferns, acorns, berries, and lights to create your layers. Amanda suggests starting small, like on the corner of a book shelf or a side table, and filling in the layers from there. She uses a lot of greenery and natural elements, as opposed to Christmas decor, because the traditional wintery pieces and can be used past December 25. 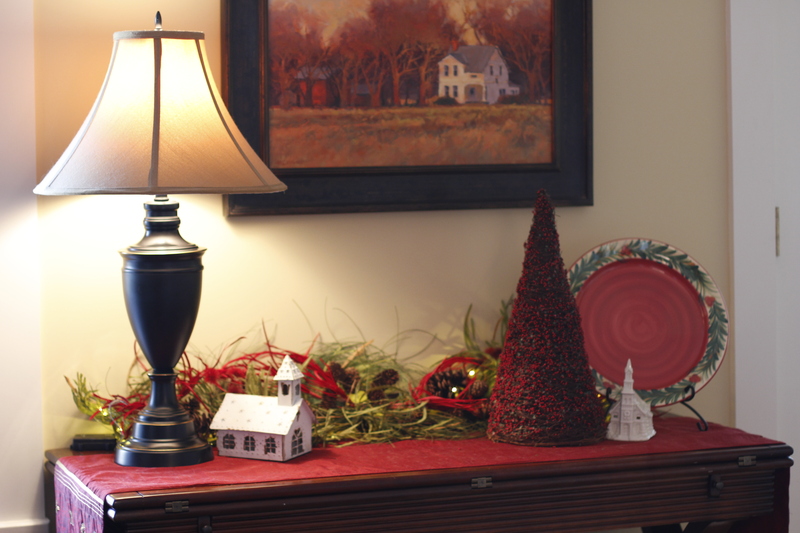 Amanda’s holiday decor includes lots of family heirlooms mixed with newer pieces. For example, she has her grandmother’s glass ornaments displayed on a cake plate and she made her mother’s childhood toys into garland by inserting it into greenery. These pieces are the most meaningful to Amanda, as they are to most of us. I think this is a great way to use old family items without looking junky. Good luck with your holiday decorating. I hope this has helped make it more fun! Color, perspective, vision! These terms from the art world define our interiors, our lifestyles and our everyday experiences and make us who we are. From early on, I sketched the world around me…from my own unique “little girl” perspective. That perspective has been refined and shaped by each and every experience. During the college years, while earning an art history degree, then traveling to Europe as I furthered my education, walking alongside my amazing husband on the long, arduous journey through med school and residency. Building a family throughout multiple moves, creating a home, only to relocate and do it all over again. Through the journey of parenthood and raising two beautiful daughters. All of these experiences have shaped my perspective, altered my “palette” and seasoned my vision…about life and the importance of the things that truly matter. Life is too short to live the status quo…we need “color”…we need each other’s perspectives and we need to be free to let our homes truly reflect our unique journey. That’s my passion. That’s how I see it!